Answer engine Wolfram Alpha can figure out anything that can be computed -- such as the distance between Earth and Mars on Valentine's Day this year. Now, if you're a Facebook user, you can use the online tool to glean a wealth of information about yourself. It will dig into your Facebook account and tell you things such as when and where you were born and even what the weather was like then, a timeline of the kinds of things you post, as well as the times and days of week that you most often post links, upload photos or update your status. Some of the responses might surprise you. While I consider myself a light Facebook user, Wolfram Alpha says that since September 25, 2010, I've made 202 posts with an average length of 21.09 words, "liked" 195 things and made 260 comments. The app also tells you which posts generated the most "likes" and comments. If there's a specific data set you're particularly interested in, you can drill down to get more detail or different charts. You can even load Facebook reports on your friends, although when I tried it the app only displayed top-level information such as frequency and timing of postings, but not which people interacted most with the friend in question. 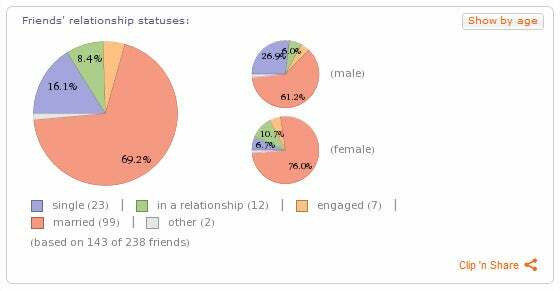 Wolfram Alpha analyzes your Facebook activity. And if you find a certain chart or piece of information particularly interesting, you can download it or share it on social networks, although if you do the latter on Facebook, for example, the app only shares a link to Wolfram Alpha, where people need to go to see your data. There, of course, they can sign up for their own Facebook report and thereby sign up for a Wolfram Alpha account. Want to know which friends comment most on your posts and who shares your posts most often? Wolfram Alpha's Facebook app will tell you, along with interesting stats on which Facebook apps you use on various days and times each week as well as what times of day during the week you're most active on the site. It also gives you pie charts that indicate the percentage of male versus female friends, how many are married, single, in a relationship or engaged, not to mention the ages of your oldest and youngest friends. In my case, my oldest friend is 111 years old, and I am only 19. Not really, of course. The thing to keep in mind here is that Wolfram Alpha -- and Facebook, for that matter -- only know the information you have freely submitted. Wolfram Alpha breaks down your Facebook data. For some people, like me and my 30-something friend who chooses to lie about his age, these companies, which benefit the more they know, are less able to hone in on who we are, what we like and with whom we most often associate if we're more vigilant about what we share online. The less data mining entities know about me, the better. Wolfram Alpha's new tool is definitely an interesting window into how much you've shared with Facebook, if you care about that sort of thing. But, it can definitely be fooled. Even so, I was surprised at how much information the app garnered from what I've posted on Facebook. To use Wolfram Alpha's Facebook report, go to www.wolframalpha.com, and in the search box input "Facebook report." You'll have to give the app permission to access your Facebook account, as well as set up a Wolfram Alpha account. I found the process of generating a report a bit unwieldy (using Chrome) and after generating a first report had to clear out my cache to get subsequent ones. Even so, it's worth checking out.